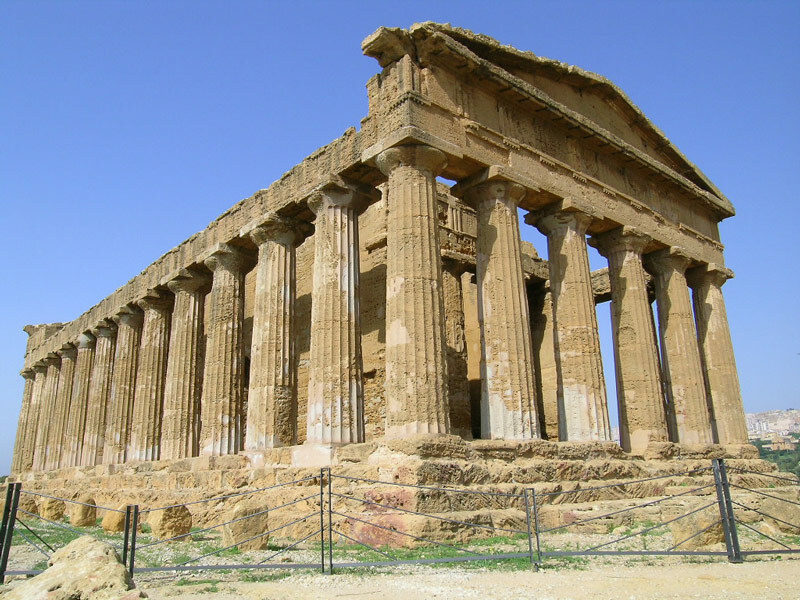 Agrigento is world famous for its valley of temples, an impressive testimony of Greek Sicily and a UNESCO heritage site. When it was called Akragas, Pindaro considered it to be “the most beautiful among mortal cities”. A good 1,300 hectares of archaeological park exists today, the richest in the Mediterranean, with ten Doric temples, sanctuaries, necropolises and the feeling that wherever you dig ancient artefacts will be brought to light. But the place is not just a priceless archaeological patrimony: its magic is in blending the ancient ruins with the landscape, the continuity of form and colour of the temples and those of the hills, striking olive green among the golden stones, almond blossom in spring, the odour of medicinal plants borne on the wind, the sea its backdrop. In the lowest point among the hills upon which the temples rise there is, “a small valley, that for its surprising fertility, resembles the Valley of Eden or a corner of the Promised Land” thus wrote, in 1778, the Abbot of Saint Non about the Kolymbetra garden that covers about five hectares and is a triumph of Mediterranean trees and shrubs: citrus, carrob, pistachio, mulberry, walnut, pomegranate, olive, myrtle, laurel, lentiscochi, euphorbia, broom, and dwarf palm. The Kolymbetra is not only a gem of a garden, but is itself archaeological evidence containing a V-c.hypogeum and aqueducts that fed a large, ancient pool able to supply water to the city. Even Andrea Camilleri’s commissario Montalbano was struck by it in “La pazienza del ragno" one reads: “I’ve discovered a fantastic place, ‘d’you know it? Its called Kolymbetra. Just think, before it was an enormous tank dug by Carthaginian prisoners”, “Where is it?” asked Montalbano “Right there, by the temples”. 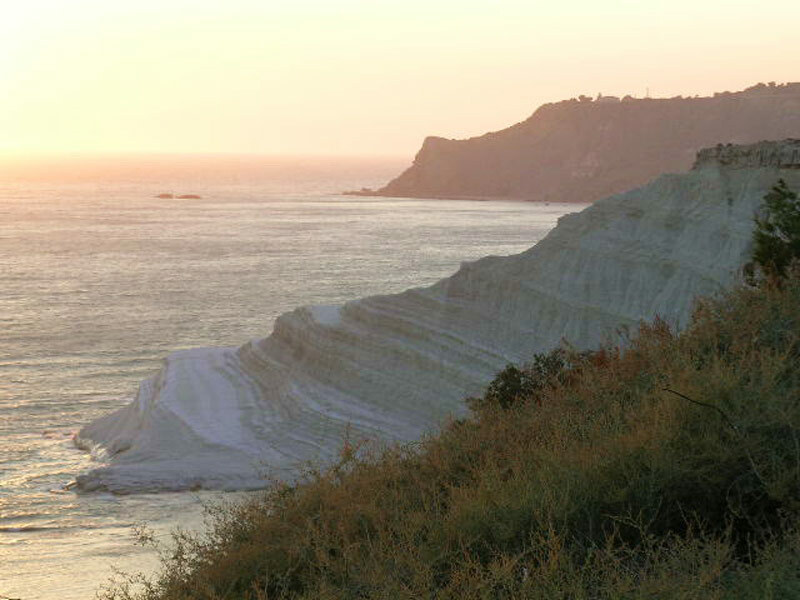 Temple hill is south of the present-day city, towards the sea, while the ancient acropolis was on the highest point of today’s town, the Athenian Rock, which has been swallowed up Agrigento’s new town. Five terraces upon which the ancient town spread were between these two levels. Akragas was founded, in 581 B.C., by colonists from Rhodes and Crete coming from nearby Gela and reached its maximum splendour in the V c. when the magnificent Doric temples were built on the southern hill. In 406 the town was conquered by the Carthaginians though with the last Punic War it passed into Roman hands who, in 210, who took over and changed its name to Agrigentum. The whole archaeological walk is extraordinary, but there are two temples that are right and proper symbols of the valley. The Temple of Concordia has remained the most intact: observing from a distance it does not give the impression of a ruin, rather, of permanency through time. Its foundation base follows the line of the hill, creating that sense of continuity with nature so typical of this place. Its best hour is at dusk when floodlights are lite and the colours of the sunset are its backdrop. Only four columns remain standing of the Dioscuri Temple: it is a small temple, but one of the most photographed because those four columns correspond to our mental picture of what a Greek ruin should look like. The temple of Juno, the temple of Hercules and the temple of Jove are all extremely important, but there is much more, like the Graeco-Roman district with the remains of patrician villas with perfectly conserved mosaic flooring. 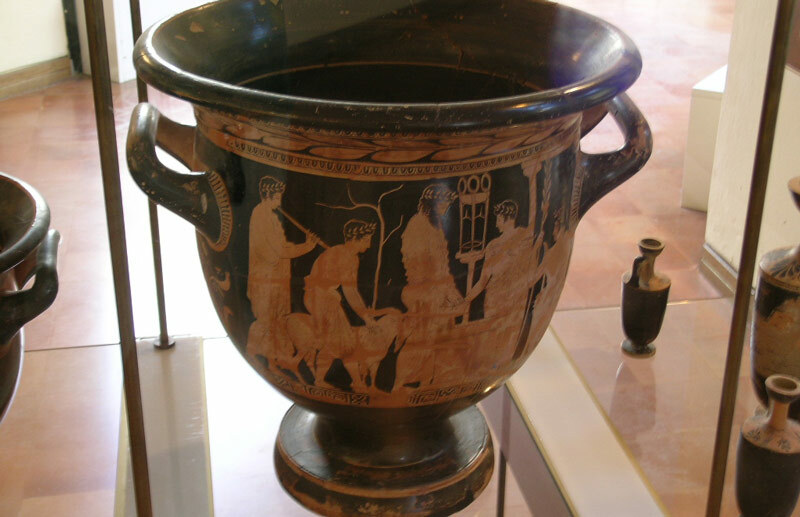 Nearby, the Archaeological Museum, the most visited museum in Sicily, with finds that testify to the civilisations that prospered in this area: statuettes, funerary urns, gold coins, jewellery, models of the ancient town lay-out, everyday utensils, and arms. You are also taken aback by the sheer size of a Telamone, one of gigantic statues that held up the pediment of the colossal temple of Zeus, one of the three largest temples in the Greek world. It was the Arabs who rebuilt the town on the hill where once stood the acropolis, with narrow streets and courts that looked a lot like those towns in north Africa. The streets and alleys converge towards Via Atenea, the most important thoroughfare of the town lined with fine shrines, mansions and churches, often showing a stratification of styles, accumulated though the centuries. Among these, the Norman-Gothic cathedral founded in the Late 11th c. and enlarged and embellished up until the 17th c.
Small, family-run taverns that serve wine, salted sardines, and olives still exist in the old historical centre, but naturally, you can also go shopping and find less characteristic though comfortable places to enjoy yourself, be it for a coffee, an ice-cream, an aperitif, lunch or dinner. It is the most famous and frequented beach resort of the city: kilometres of fine sandy public beaches. In the beach kiosks you can enjoy an ice-cream and in the evening piano bars and caffè concertos open for business. For youngsters there are venues where dancing goes on till late. About four kilometres from the town centre and two from the valley of temples stands the house where, in 1867, Luigi Pirandello, world renowned dramatist and 1934 Nobel Prize winner, was born. Though it has no particular architectural merits, it has become the destination of scholars and tourists for the patrimony and memorabilia that maintains the authors presence alive. Known as the Black Saint, for the colour of his skin, during the procession loaves of bread are thrown and at each stop the devout embrace and kiss the statue, invoking Grace. The Festa lasts from the first to the second Sunday in July and it is particularly characteristic, mixing elements of popular belief, legend, and ancient traditions. A one-week festival in February during which folk groups from around the world perform their set. It is one big celebration for the early coming of spring and early blossoming of the almond trees, a miracle of the mild Agrigento climate.